Wes Ellis: Where the hell did we get our ideas about hell? Where the hell did we get our ideas about hell? 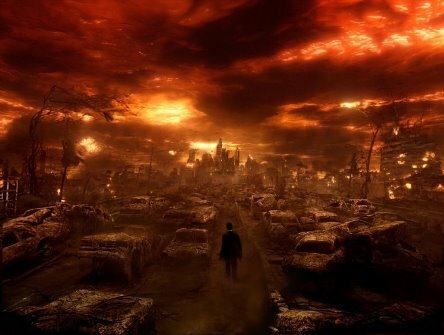 Next semester I'm taking an independant study course on the doctrine of Hell with Dr. Dennis Okholm. In this independant study I get to choose most of the books I read and I was wondering if anyone had any good suggestions. I will read A book on the Jewish Old Testament theology of Hell, a book on the New Testament and church father understands of Hell, a book that spans a survey from the Church fathers to the Enlightment on Hell, and a book about our Modern day understanding(s) of Hell. I will Write five pages about each book I read and a fifteen to twenty page paper at the end of the semester on Hell as an evolutionary doctrine. The problem is that I don't know how well those books will fit into the categories I have laid out for myself. I'm sure D. Okholm will be able to help with that but I was wondering if any of you had any good suggestions. My suggestion is The Fire That Consumes by Ed Fudge. I do not know where it will fit in your categories, I think it will cover OT and NT views as well as contemporary views. I never read it all the way through, but breezed through it about 8 years ago. As I recall, it is a difficult book to read, but thorough. And, I have seen a few other books, not least Hell Under Fire, that recognize Fudge as one of a handful of exhaustive books that must be dealt with. Two things about Fudge. 1) He is from the Churches of Christ, as am I. (He is one of a very few who have splashed with any significance in the wider ocean of world scholars outside of our CofC pond.) 2) He takes the view that "lost souls" or what ever you care to call them, are extinguished. Right off I forget the term for that view. It opposes the traditional view of Hell, and also the Universalist view that eventually everyone "gets saved." Sounds like a cool study. You should put a new picture up on the blog so we can see if you look smarter. :) I wish I was taking the class with you. I'll definately check out Fudge! As you may know, the subject of Hell was what put me into a tail spin about a year ago. It was something I began to question and then because of it I began to question many other things. I even questioned my faith. The Lord finally helped me come to a conclusion: "I don't know". I have an opinion based on what I have read but I have reconciled with whatever anyone wants to think about it. I quit my research because it was tearing me apart so I don't really have any suggestions. I'm going to e-mail you. While I completely agree with the Bible's assertion - that Satan does exist, I definitely do not think of him as our little red-devil friend with a pitchfork... The reality is that he is much more strategic and evil than that picture affords. It also seems clear from scripture that anytime we are separated from God we are, in a sense, "in hell." So, for me, hell is not so much about burning rocks and fire and brimstone - it's more about eternally being apart from complete love - all that real love is, in the person of God. How Hell looks and what it includes is far less important to me than the reality that without a faith in Jesus Christ I am eternally separated from God. - "The History of Hell" Alice K. Turner #0156001373 This looks like a good summary of the beliefs about hell through history. Also, C. S. Lewis has some definite views on hell. I have the book "Beyond the Shadowlands" which analyzes his views of Heaven and Hell. Interesting choice of topics! That, in itself, warrants analysis.